Want to run Tomb of Horrors, White Plume Mountain or Against the Giants in 5th edition? D&D is here for you. Dungeons & Dragons will release Tales From the Yawning Portal, which will update the aformentioned classic modules to 5th edition as well as Shrine of Tamoachan, Sunless Citadel, Forge in Fury and Dead in Thay. The 248-page book will be released on April 4. Game stores will have it March 24. 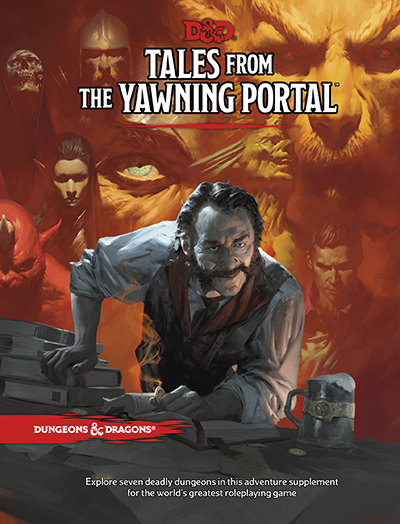 The title and cover image of the hardcover book references the Waterdeep tavern Yawning Portal and its barkeep, Tyler Jacobsen. The book features all seven adventures as well as lots of traps, challenges, monsters and magic items you can use in other adventures. This should appease D&D fans who have been clamoring for shorter adventures than book-length campaign tomes such as Storm King’s Thunder and Curse of Strahd. A lot of DMs want shorter pieces they can weave together or stick into other campaigns. These should also help DMs who want something to run when adventures such as Curse of Strahd are over. I think it gives more options to DMs, and that’s a good thing. What do you think of the new book? Let’s talk in the comments.